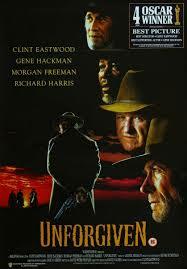 Unforgiven (1992): Dir. Clint Eastwood. Written by: David Web Peoples. Starring: Clint Eastwood, Gene Hackman, Morgan Freeman, Jaimz Woolvett, and Richard Harris. Rated R for Rated R for language, violence, and a scene of sexuality. Running time: 131 minutes. Having helped define the western both as an actor and as a director, Clint Eastwood returned to the genre with an axe to grind. The sudden rejuvenation of the western film (thanks to Dances with Wolves) spurred on this dark noir, which plumbed the depths of one of cinema’s iconic settings. In late-nineteenth century Wyoming, former outlaw William Munny has renounced his life of crime and taken up an honest (if unreliable) trade as a pig-farmer. With his livelihood looking desperate, he agrees to take up one last job with a young gunslinger: kill two bandits who mutilated a prostitute. The film skillfully weaves questions of morality into a purposely antiquated setting. Is it right to kill two men who haven’t actually killed anyone themselves, but might have had they not been stopped? What criteria make it “okay” to kill a human being? Affecting a twilight-infused tinge, the film has a weary and drained look, abetting the ethical complications raised by the script. Even with the bleak tone, Eastwood the director constructs some well-realized set-pieces, one in a rocky canyon and another in the town saloon. There’s a certain thrill to these sequences which perhaps undercuts the film’s skepticism of violence, but they’re impressively staged and shot. Eastwood plays the aged gunfighter in a mostly effective performance (though sometimes we’re not sure if he’s playing the character or if he was tired on that day of shooting). More striking is Jaimz Woolvett as the cocksure “Scofield Kid” and Gene Hackman as the town sheriff, Little Bill. Hackman melds menace with the sensibilities of a modern-day social climber. While Eastwood and the script sometimes lay it on thick, the result of this “twilight western” leaves plenty of questions even as it comes to a superficial resolve. For my money, it’s the best western to win Best Picture.